From a young age Daniel Brown has had a strong interest in Health, Nutrition and Fitness. He was first introduced to the Chiropractic profession by a Chiropractor at a careers convention when he was 15 years old, and decided at that point that this was the career for him. He was accepted to study at the Anglo European College of Chiropractic (AECC) in Bournemouth on a five year course and since then has never looked back. Daniel Brown believes the body is a self-healing, self-regulating and self-developing organism and provided there is no physical, chemical, or emotional interference it is designed to be healthy and function to its full potential. 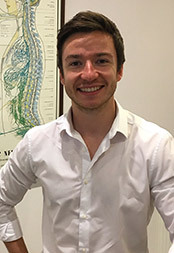 Understanding the importance of keeping up to date with the most current research and education, Daniel travels around the world to attend courses and seminars on the Art, Science and Philosophy of Chiropractic. 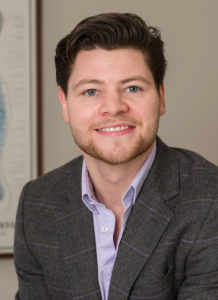 Josh was born and brought up in a small town in Buckinghamshire, England, and now resides in Edinburgh, after joining the Chiropractic Life team. 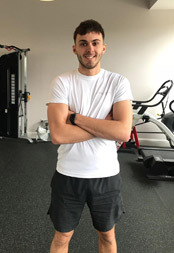 Josh has always had a keen interest in the human body and how it works, which after finishing school lead him on to study Sports and Exercise Science at The University of Leeds. It was during this time that Josh was first exposed to the philosophy of Chiropractic, and after some further research and observing Chiropractors in practice, he soon decided that this was the career for him. During his 4th and final year Josh recalls seeing patients who were achieving great results with their Chiropractic care, but felt there was more that he, and the patient could be doing to improve their overall health by combining lifestyle changes with their care plan. “If a person can think well, move well and eat well with a clear and un-interfered nervous system there is no limit to the human potential.” This is what initially led Josh to the 8 Weeks to Wellness programme, as it incorporates all of these elements, with Chiropractic at its core. Consequently, it was at an 8WW conference that Josh met Dr. Dan Brown (Chiropractor), and it soon became clear that they both shared the same passion and vision for the future of Chiropractic, Health and Wellness. After visiting Chiropractic Life and meeting the team who also possess the same passion and vision, Josh knew that this was where he wanted to be. Josh looks forward to helping as many patients as possible to achieve their potential through a Chiropractic lifestyle. Outside of clinic his interests and hobbies include: Gym, playing and watching football, music including live gigs/events, food and exploring all Scotland has to offer! 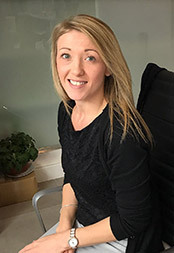 After a career in retail management, Liz started working as a Chiropractic Assistant for Wight Chiropractic Clinic in 2001 before the clinic was re-established as Chiropractic Life. It was after being diagnosed with Rheumatoid Arthritis that Liz became extremely interested in health, nutrition and the natural methods of healing and managing her condition. Liz was born in Perth and has two adult sons and two beautiful grandchildren. Over the years Liz has developed an extraordinary relationship with all our patients and is an extremely valuable member of the team. West Rhine-Westphalia born and raised, on the playground is where Lisa spent most of her days, chilling out, maxing, relaxing all cool and shooting some b-ball outside of the school. In her formative years, she developed a keen interest in running and equestrianism, competing at a regional level in both. Following her heart, Lisa moved to Scotland in 2012, completing her degree locally at the University of Highlands & Islands. After spending several years managing a team of childcare professionals, she has developed a first hand understanding of the impact of healthy eating on energy and attention levels. In March 2018, looking for a change of environment, Lisa joined Chiropractic Life. Her ‘think-positive’ attitude has seen her adapt well to the world of wellbeing, and she has developed into an integral member of the team. Katie was born in Perth and grew up in a small town in Perthshire. As a keen sport lover, she spent many years as a Dancer and Gymnast, working her way into the Scotland squad for Gymnastics. 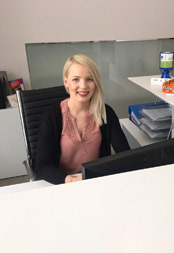 Katie is a devoted mother to her daughter and son and loves quality time with them, her partner and family. In her own time, she enjoys exploring new places and getting out into the countryside. 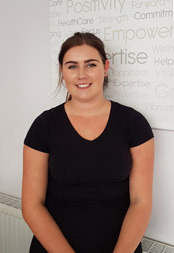 Katie is looking forward to continually building upon her health and chiropractic knowledge and of course getting to know all of our lovely patients. Katie joined the Chiropractic team in 2017 after further expansion of the clinic. Liam Bruce was born and raised in Perth, Scotland. He attended Perth High School where he developed a keen interest in health and fitness from a young age. After school, Liam accepted a place at Perth College University of the Highlands and Islands, where he later graduated with a BSc Honors Degree in Sports and Fitness and gained his level 3 Personal Training qualifications. During his second year of studies Liam was also awarded the OBI (Outstanding, Best and Inspirational) for being the ‘Student Rep of the Year’, as well as the ‘Student of the Year 2015′ award for University of the Highlands and Islands. Liam is passionate about helping others to bring out the best in themselves and strives to see them make positive lifestyle changes that will impact their overall health and quality of life. 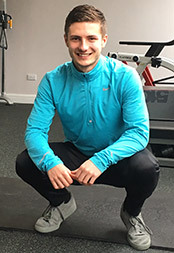 Craig Sandilands has worked within the fitness industry in Perth for the past 5 years, during this time he has also graduated from the University of Highlands and Islands Perth College with a BSc (Hons) in Sport and Fitness. Working in the industry whilst studying at the same time allowed Craig to implement newly gained knowledge straight into his job. This allowed Craig to further develop his knowledge as well as equip him with industry specific skills and experience. Whilst studying his degree the topics that interested Craig most, and continue to do so, were sports rehabilitation, nutrition and how regular physical activity can significantly improve health and wellbeing. Unfortunately due to a serious injury Craig had to stop playing rugby, however now enjoys sports such as mountain biking, rock climbing and snowboarding. Craig believes the most important thing about personal training is effectively coaching your clients to improve their health and fitness, reach their goals and to improve their general wellbeing through other positive lifestyle changes. The look of achievement on a client’s face when they achieve a goal they once thought was impossible is Craig’s favourite thing about Personal Training. Matt was born in Aberdeen and educated at Merchiston Castle School in Edinburgh, where he achieved the position of School Captain in his final year. With a keen interest in Advertising Matt attended Lancaster University business school where he received a BaHons. in Marketing & Communications. On graduation however, the Oil & Gas industry proved more alluring which led him to spend the next 5 years training and working as a specialist engineer on the drilling rigs. Matt has since undergone an ICF Coaching qualification and now works with a range of clients to help support their personal & professional development. In his spare time Matt enjoys working out, shooting, fishing, climbing, snowboarding and hill-walking, combined with a keen interest in travelling the world. 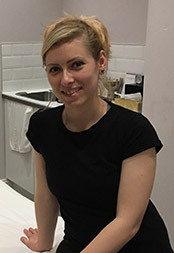 Arabella’s passion for health and fitness started at a very young age whilst practicing various sports, including horse riding, swimming, athletics, and ballroom dancing. She believes that these experiences gave her a deeper understanding of the body, and came to understand that assessing the body should not only be about identifying pain, but maximizing function and the potential of each individual. 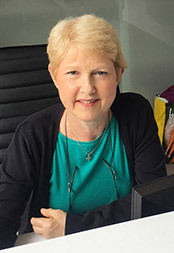 In 2013 Arabella accomplished the Lymphedema Drainage course at the Joint Szent István and Szent László Hospital, in Budapest, where she aquired here not only the advanced limphatic drainage techniques, but also the specific physical exercises for limphatic circulation improvement. Arabella is also trained to practice diversified techniques of soft tissue work to treat a range of spinal and extremity problems. She is passionate about helping her patients not only free themselves from pain, but also keep the body in its natural balance and health. Samuel was born in Spain and raised on the island of Gran Canaria. 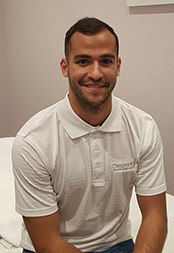 His passion for improving body performance through massage initially came from practicing football from a young age, where he often got injured. It was through his injuries that he began to become fascinated with body recovery and the philosophy of how the body can recover from massage. After finishing his studies, Samuel spent a year as a Sports Masseur with a professional football team of second division in Norway (Nybergsund il trysil). 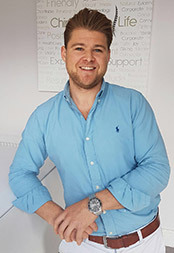 Samuel is passionate about health and the good life in general, where his philosophy is based on personal positive energy and working every day on the full satisfaction of his patients and creating smiles. After leaving school Louise began training at the Scottish School of Contemporary Dance. Throughout her training she sustained some injuries and was pointed in the direction of Massage Therapy by her tutors. This was when she discovered the healing benefits of Massage. Throughout her dance training she developed an interest in health and wellbeing, which lead her to pursue an HNC in Health, Fitness and Exercise at Dundee & Angus College. Louise was awarded Student of the Year. Since then she has furthered her studies and completed a Bachelor’s Degree in Sport and Exercise Science at Abertay University. While studying at university her public health modules really stood out and she loved the concepts of working with people to address the cause of their issues and work together towards the goal of health, opposed to treating symptoms. It was during her time at University she was offered the chance to train in Sports Massage and has never looked back. Louise enjoys regularly teaching gym classes, the gym and exploring Scotland’s midlands such as Kenmore. Give our Perth chiropractic office a call or send us an email today.